The Global Volcanism Program has no activity reports for Los Atlixcos. The Global Volcanism Program has no Weekly Reports available for Los Atlixcos. The Global Volcanism Program has no Bulletin Reports available for Los Atlixcos. 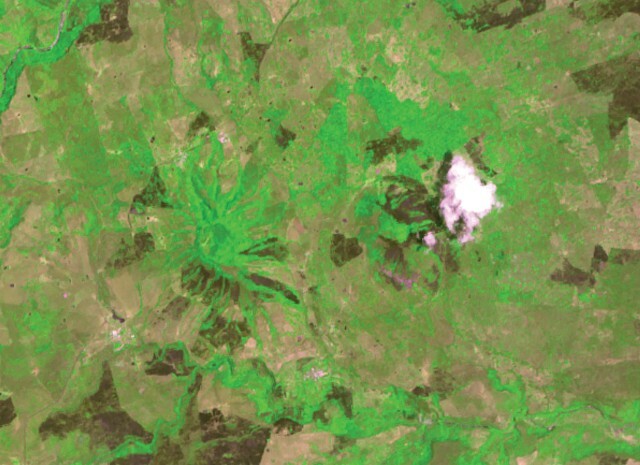 Los Atlixcos, also known as Cerro el Abra, consists of a shield volcano topped by two large pyroclastic cones and associated lava fields at the eastern end of the Mexican Volcanic Belt along the Gulf of Mexico about 80 km NW of the city of Veracruz. The two pyroclastic cones, both known as Cerro los Atlixcos, lie along an E-W line about 2 km apart; both cones are breached to the east. A broad apron of basaltic lava flows extends primarily to the north and east, reaching as far as the coast. The extent of the lava shield is defined by the Río Santa Ana on the NE and the Río El Tecuán on the south. The youthful morphology of the cones caused Negendank et al. (1985) to consider them to be of Holocene age. Other pyroclastic cones of Quaternary age are located to the NW, and a group of cones and silicic lava domes of Tertiary-to-Quaternary age were constructed along the coast to the SE. Ferrari L , Tagami T, Eguchi M, Orozco-Esquivel M T, Petrone C M, Jacobo-Albarran J, Lopez-Martinez M, 2005. Geology, geochronology and tectonic setting of late Cenozoic volcanism along the southwestern Gulf of Mexico: the Eastern Alkaline Province revisited. J. Volcanol. Geotherm. Res., 146: 284-306. The Global Volcanism Program is not aware of any Holocene eruptions from Los Atlixcos. If this volcano has had large eruptions (VEI >= 4) prior to 10,000 years ago, information might be found on the Los Atlixcos page in the LaMEVE (Large Magnitude Explosive Volcanic Eruptions) database, a part of the Volcano Global Risk Identification and Analysis Project (VOGRIPA). There is no Deformation History data available for Los Atlixcos. There is no Emissions History data available for Los Atlixcos. Pyroclastic cones capping the Los Atlixcos shield volcano lie left of the white atmospheric cloud at the center of the image. Lava flows from the shield volcano traveled north and east to reach the coast of the Gulf of Mexico along a broad front covering most of the coast in this view, which covers approximately 10 km in a N-S direction. The west-flowing Río El Tecuán at the bottom of the image defines the southern margin of the lava shield, while the NE-trending Río Santa Ana at the upper left marks the NE margin. 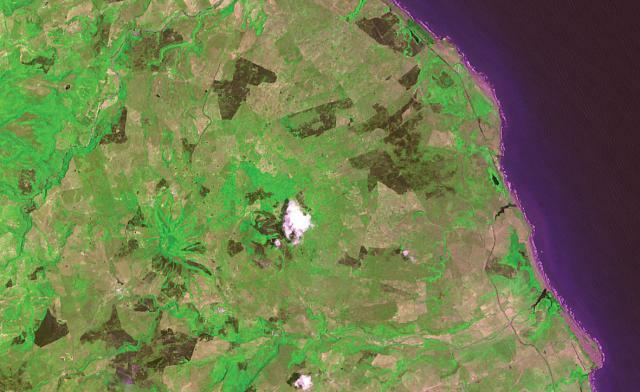 ASTER satellite image, 2002 (National Aeronautical and Space Administration, processed by Doug Edmonds). Radial drainages outlining two pyroclastic cones capping the Los Atlixcos shield volcano are visible immediately left (west) of the weather cloud and 2 km farther west at the left center. The two cones, both known as Cerro los Atlixcos, were constructed along an E-W line and rise 200-300 m above a connecting saddle. The 800-m-high western cone is 100 m higher than the eastern cone; both cones are breached to the east. Lava flows from Los Atlixcos reached the Gulf of Mexico along a broad front. There are no samples for Los Atlixcos in the Smithsonian's NMNH Department of Mineral Sciences Rock and Ore collection. Large Eruptions of Los Atlixcos Information about large Quaternary eruptions (VEI >= 4) is cataloged in the Large Magnitude Explosive Volcanic Eruptions (LaMEVE) database of the Volcano Global Risk Identification and Analysis Project (VOGRIPA).